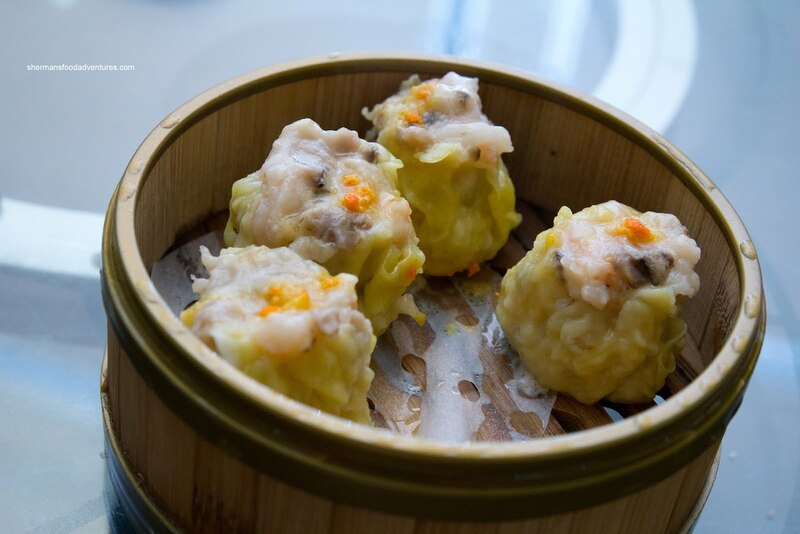 "Uh, Dim Sum? ", nervously questioned my dad when I suggested we do so while we were in Bellevue. I can't blame him as his only experience with Chinese food down there was back in 1997 at Noble Court. That left a bad taste in his mouth, which he still remembers to this day. I assured him that Chinese food has come a long way since then. 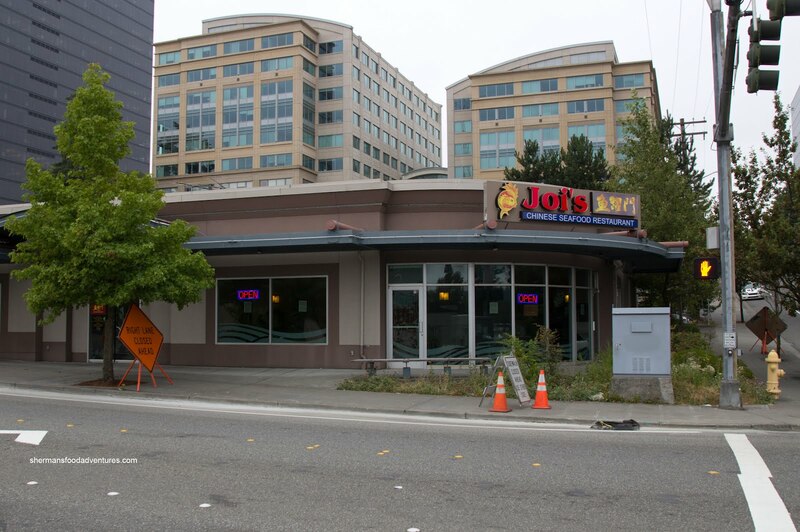 Having just recently visited Top Gun and being satisfied with the quality of the eats, I thought we'd try out Joi's out in Downtown Bellevue. 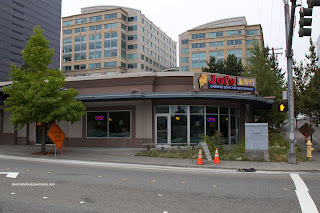 Previously Koi's, the name change had not been reflected in the menu nor the parking signage as of yet. And about that parking... The onsite parking lot must've been designed to fit only Smart cars or Fiat 500's. My SUV took up 2 spots and I tried my darnedest to make it fit into one. So if you want to avoid this problem, park in their alternative lot instead. We had arrived pretty early, so it was easy to get a table in the spacious and clean dining room. With push carts patrolling the aisles, we were pretty much able to get most of our food immediately. Let's start with the basics shall we? The Haw Gow were a bit on the smallish side, yet were more than acceptable. The dumpling skin was a touch chewy while the shrimp filling had the necessary snap texture. Flavorwise, it was seasoned just enough with a hint of sesame oil. We certainly couldn't have haw gow without Sui Mai (well, at least I can't), so that was a given we'd get an order. 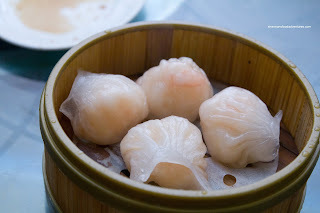 These were also quite good with a decent amount of snappy shrimp. The pork was slightly bouncy with some moist pieces. 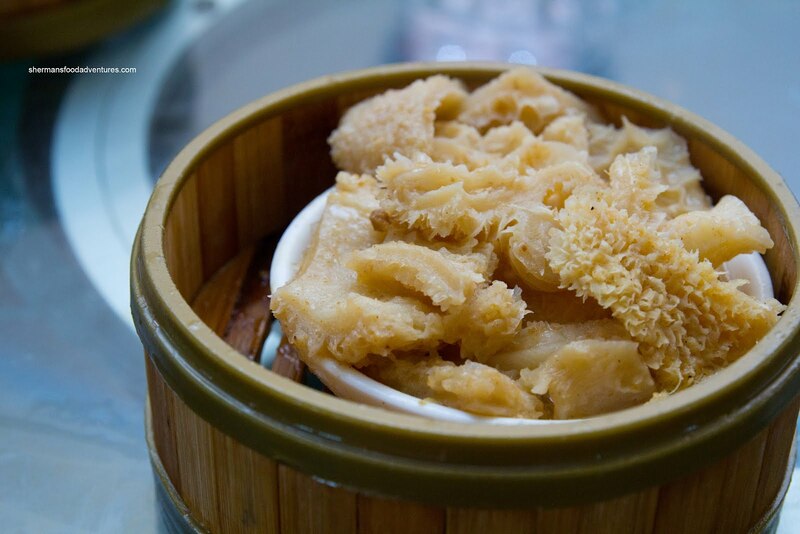 A noticeable amount of shiitake mushrooms added to the good balance of sweet and savory. 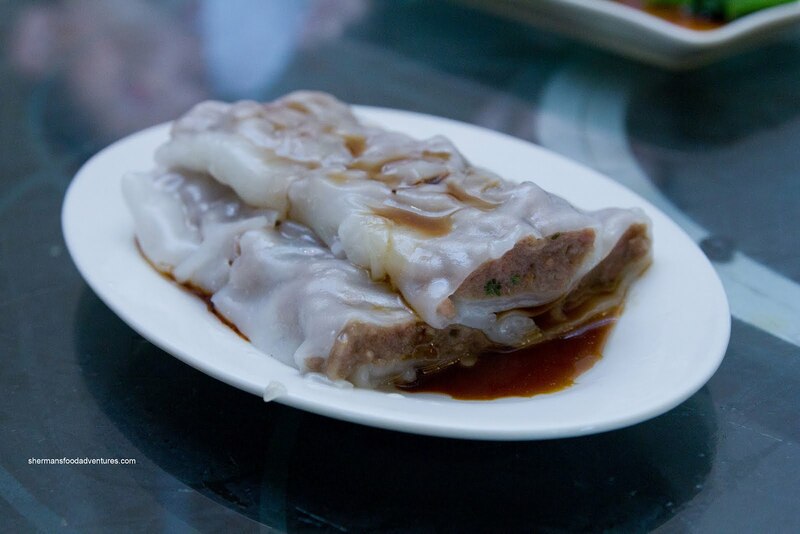 Moving along to another staple of Dim Sum was the Beef Rice Noodle Roll (and the Shrimp Rice Noodle Roll, not pictured though). The rice noodle itself wasn't too thick, yet was still slightly gummy and chewy. The beef filling was both plentiful and done properly. The texture was smooth and had a rebound quality while having just the right amount of green onion. As for the shrimp rice noodle roll, the shrimp filling was a bit meager, but did exhibit a good snap while being mildly seasoned. 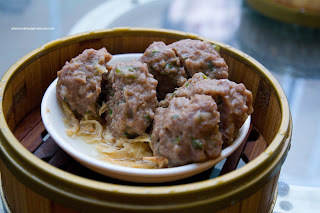 With a close relation to the beef rice noodle roll, the Beef Meatballs were pretty good as well. The meat was a touch moist, yet still exhibited some chewiness and bounce. Again, there was the right amount of greens mixed into the meat where it added some brightness without being overwhelming. A little on the sparse side in terms of quantity was the Black Bean Spareribs. Whenever you can see the bottom of the plate before even a single piece is never a good thing. Anyways, as you can clearly see, the dish was rather greasy as evidenced by the pool of oil. Despite the lack of content, most of the pieces were meaty and attached to bone, not cartilage. The meat was on the chewier side, yet not difficult to eat by any stretch of the imagination. In terms of flavour, it could've benefited from more black bean and garlic. 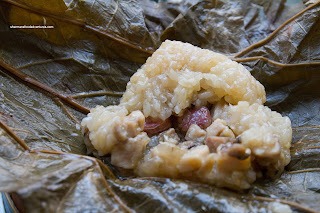 Onto the Loh Mei Gai (or sticky rice), it was a bit wet. I really didn't mind because I really can't stand dry and hard sticky rice anyways. I guess the overload of ingredients (ground pork, shiitake mushroom, Chinese sausage and chicken) in the middle helped contribute to the moisture. At this point, we noticed a new push cart being employed on the floor and quickly realized it contained dessert tofu. We flagged down the young lady and ordered a bowl. Nothing particularly interesting about the dish (and no picture either), but something bizarre happened at the table next to us. They had also ordered the dessert, but the young lady proceeded to put a heaping spoonful of green onions on it (and without simple sugar either). 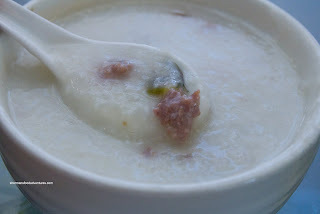 We believe she mixed up the dessert with the other item on the cart, which was Preserved Egg and Salted Pork Congee. Suffice to say, the people at the table were thoroughly confused and judging by their reaction, didn't like the green onion unsweetened tofu dessert! Fortunately, the congee (without green onion) was not bad. It was thick and smooth all the way to the last spoonful. There were some ingredients to be found, but they were in little itty bitty pieces. 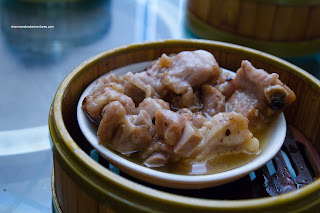 I liked the pork as it was tender and slightly salty. There was a considerable MSG flavour which I didn't particularly care for. Dim Sum would not be complete without some offal (it would make Chris Cosentino proud...). So we got an order of the Honeycomb Tripe. There was a good amount of tripe crammed onto the small sauce plate in the bamboo steamer. It had a good chewy, but soft texture which was not gamy (which meant they had rinsed it properly). I liked how there was a good balance between salty, sweet and spiciness. 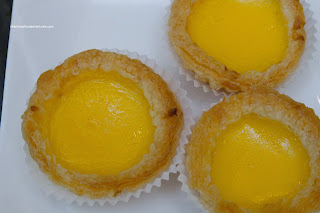 Lastly, we got an order of the Egg Tarts which were also pretty good. The tart shell was flaky and buttery while the egg custard was on the sweeter side. At the end of our meal, my parents were pretty impressed with the overall quality of the Dim Sum considering we were not in Vancouver. If I had to chose between Top Gun and Joi's, it would be literally a toss up. The food is pretty comparable as well as the parking. "My SUV took up 2 spots and I tried my darnedest to make it fit into one." So it was YOU buying milk at Costco !! !